4 Bedroom Detached House For Sale in Attleborough for Guide Price £425,000. Guide Price 425,000 - 450,000. The Poplars is a superior executive home, located within an exclusive development on the fringes of the market town of Attleborough. It has been designed to a very high specification and exacting standards. The property totals approximately 1760 sq ft (including garage) and features a good sized hallway, spacious sitting room, open plan kitchen/dining room with bi-folding doors leading into the garden, study, separate utility room and ground floor cloakroom. On the first floor the master bedroom enjoys a luxury en-suite shower room. The second double bedroom also enjoys an en-suite shower room, with an additional two bedrooms off the landing which share the family bathroom. 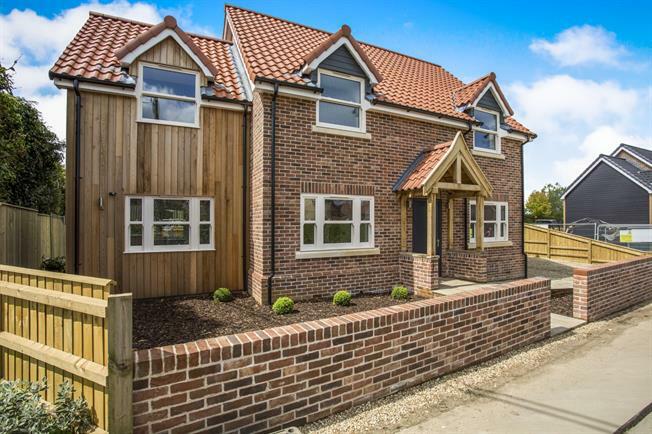 Externally this stunning new home has a detached garage and turfed gardens with close-board fencing. Images shown are for illustrative purposes only. Choice of carpets in main living areas subject to build stage and choice of floor covering in kitchen/dining room, utility room, hall and to all bathrooms subject to build stage. Under-floor heating system from air source heat pump to downstairs living areas. Oak effect internal doors. Choice for floor and wall tiles subject to build stage, vanity units, white “Briston” sanitary ware with chrome fittings. The information contained within these sales particulars should not be relied upon as statements or a representation of fact. Prospective purchasers should note that any elevations, room sizes/layouts have been taken from plan and may vary as construction takes effect. Any plans shown are not to scale and are for guidance purposes only. Any specification shown is correct at the time of printing. Images shown are for illustrative purposes only.